Buddhism, one of the world's great religions, traces back with the life of Siddharth when a curious wandering prince from the small Shakya Kingdom located at the foothills of the Himalayas in Nepal, began his quest for the ultimate truth to solve the mystery of existence. He renounced his royal pleasures and meditated beneath the sacred Bodhi tree at Gaya for years before he attained spiritual enlightenment. Then, as the Buddha, or the enlightened one, he spent the remainder of his life spreading the knowledge of The True Self in the Indian sub-continent. However, it was during the reign of emperors Bimbisara, Ashoka, Milinda and Kanishka that Buddhism flourished at its best and became a global religion, especially in Southeast Asia, due to sincere and untiring efforts of the missionary Bhikshus. 13:00 hrs. Assemble at the Delhi Safdurjung Railway Station. Traditional Welcome and check in to your respective coaches. 14:30 hrs. Departure of the train for Gaya. Evening Tea & Dinner served on-board. Overnight stay on-board. Arrive at Gaya Railway Station early morning. Disembark and assemble for boarding the coaches for road journey of approx one hour to Bodhgaya. Arrive at Bodhgaya Hotel and check-in. Wash & Change, followed by the breakfast. After breakfast proceed by coach for sightseeing of Bodhgaya including Mahabodhi Temple & Niranjana River. Return to the Hotel for lunch and relax for some time. Proceed for sightseeing of Thai Temple, Japanese Temple and Buddha Statue. Evening.  Return to Hotel, dinner and overnight stay at hotel in Bodhgaya. 05:00 hrs.  Early morning tea & breakfast followed by checkout from the Hotel. Departure for Rajgir by bus (85 Kms). 10:30 hrs.  Arrival at Rajgir. Sightseeing at Rajgir of Bimbimsara Jail, Gridhakut hill, Venuvan. 12:30 hrs.  Proceed to a Restaurant in Rajgir for lunch. After lunch, proceed to Nalanda for sightseeing covering ruins of world famous Nalanda University & Nalanda Museum. 16:00 hrs.  Depart back to Gaya Railway Station. 20:00 hrs.  Arrival at Gaya Railway Station and board the train. Dinner on-board. Departure from Gaya at 2330 hrs to Varanasi (220 kms) by train. Overnight stay on-board. Early morning tea on-board and arrival at Varanasi. Proceed to the hotel for wash & change (room given only for wash & change) and breakfast. After breakfast, visit Sarnath (10 kms) for to see Dhamekh Stupa, Sarnath Museum, The Ashokan Pillar, Mulgandha Kuti Vihar. Afternoon  Lunch at the hotel. Followed by some free time. Tourists can either opt for shopping or other activities. Evening  Visit to the river Ganges Ghat, Boat ride, Evening Arti. Return to the Train. 20:00 hrs.  Arrival at the Varanasi Railway Station and board the train Dinner on board. Departure for Gorakhpur (224kms) at 23:30 hrs. Overnight stay on-board. Early morning tea on board. Arrive at Gorakhpur Railway Station. Proceed by coach to Hotel at Gorakhpur/Kushinagar. Arrive at the Hotel in Kushinagar and check-in. Breakfast at the Hotel. After breakfast, visit Mahaparinirvan Temple, Rambhar Stupa, Mata Kutir Temple etc. Afternoon  Lunch at the Hotel. Evening participate in a chanting and meditation session. (Subject to availability of appropriate teachers/instructors).Dinner and overnight stay at Hotel. 05:00 hrs. : Early morning tea and breakfast at the hotel. 06:00 hrs.  Check-out of the Hotel and proceed to Lumbini. (Nepal) by bus. Tourists must obtain the Nepal visa from their respective countries. Otherwise, lot of time required at the border to process the visa. Arrive Lumbini and proceed to a hotel / restaurant for Lunch. 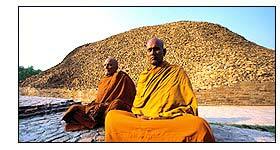 Visit Lumbini including Maya Devi Temple, Ashokan Pillar and Pushkarni lake. 16:00 hrs  Departure for Gorakhpur. Arrive Gorakhpur Railway Station. Board at around 20:30 hrs and board the Train. Dinner on-board, Depart by train to Gonda at 23:30 hrs. Overnight stay on-board. Early morning tea on-board and arrival at Gonda Railway Station. Departure for Sravasti (65kms) by bus. Arrival at the hotel, wash & change (room given only for wash & change) and breakfast. After breakfast, visit Jetvana Vihara, Pakki Kuti & Sehat Mahet, Thai Temple. Afternoon  Lunch at the Hotel and proceed to back to Gonda railway station to board the train. 17:00 hrs  Arrival at the Gonda Railway Station to board the Train. Depart by train to Agra (450 kms) at 18:00 hrs. Evening Tea and dinner served on-board. Overnight stay on-board. Early morning tea, wash & fresh and breakfast on-board. After breakfast, proceed for the sight-seeing of the World famous Taj Mahal. 12:30 hrs.  Proceed to the Agra Railway Station. Departure by train for New Delhi (220 kms) at 14:15 hrs. Onboard lunch and evening tea. Arrival at the Delhi Safdarjung Railway Station at approximately 18:30 hrs. USD 150/- per Pax for confirmed 2 berth cabin in AC 1st class for Full/Partial tour. USD 200/- for single occupancy in hotel for entire tour or USD 50 per night. USD 580/- per person (full/partial) would be applicable for confirmed allocation of one lower berth only in a 2 seater first class cabin. Upper berth would not be allocated to other passenger. USD 580/- per person (full/partial) would be applicable for confirmed allocation of two lower berths only in a 4 seater first class cabin. Two upper berths would not be allocated to other passengers. 2. The voucher is to be carried by the passenger during the journey along with the above photo identity card in original and is valid only when presented with this photo identity card. If the relevant photo identity card is not accompanied with this voucher, it will be considered as ticket-less travel and treated accordingly. 3. The exact train timings are subject to minor modifications. All the travelling passengers must reconfirm the timings with IRCTC, corporate office before the start of their journey. 4. This voucher is to be carried by the passenger during the journey along with the above photo identity card in original and is valid only when presented with this photo identity card. If the relevant photo identity card is not accompanied with this voucher, it will be considered as ticket-less travel and treated accordingly. 5. On demand from ticket checking staff the passenger should produce this voucher along with the above mentioned photo identity card. (a) It may be noted that due to recent change in visa rules, travelers having multiple entry Indian visa on their passport may not be allowed to re-enter India (within Two months) after their Lumbini visit (as per this program).Travelers having double entry Indian visa will only be allowed to re-enter India after their Lumbini visit. (b) Travelers are requested to recheck with Indian visa issuing authorities in their respective countries to have the appropriate visa enabling them travel to Lumbini and return to India. Travelers must present their travel itinerary to the visa issuing authorities at the time of visa application. (c) All Foreign Tourists other than Indian Passport Holders must obtain a valid Indian visa allowing them to visit Nepal (as per the tour itinerary) during the tour and come back to India to complete the tour. All foreign tourists must recheck with visa section at the Indian Embassy / Indian Consulate / Visa Processing authority in their respective countries for the appropriate visa (Double Entry or Multiple Entry) as per their travel program. (d) All Foreign Tourists other than Indian Passport Holders must have valid Nepal visa. In case foreign tourists are unable to process their Nepal visa before joining the tour, IRCTC will facilitate visa processing at the entry post. Such passengers should carry 2 passport size photographs with them. The visa fees if any will be paid by the passengers directly. 7. IRCTC reserves the right to refuse booking or travel of any passenger without assigning any reason. 8. No refund or adjustment will be made in the event of interruption / non-use of full or any part of the tour or tour service by a tourist on his own after the commencement of the tour or closure of a sightseeing place or monument due any unknown reasons or closure on account of the decision /order of the local municipal administration /any other government authority / unforeseen events, circumstances, situations etc. 9. In case any sightseeing being missed on account of the delay in local transportation buses / train due to the reasons beyond our control, no refund shall be made. 10. Being a group tour, passengers would be required to share the bus / buses and train accommodation with other passengers. In case any passenger / passengers wish to travel in separate bus/buses, he/she should inform IRCTC at least one month in advance. IRCTC would try to make appropriate arrangement for which passenger / passengers would be required to make additional payment. For the smooth operation of the tour, passengers would need to adhere to the instructions given by the Tour Manager from time to time. 11. As per the tour program, this tour involves few long road journeys also. Due to inadequate infrastructure (toilets etc.) en-route, passengers may get little uncomfortable. However, efforts will be made to give breaks at the appropriate places and as & when required by the tourists. 12. Train / Road journey time may exceed the expected travel time due to unforeseen circumstances such as traffic jams, break down of buses etc. This may result in late meal service, shortened / late/or no sightseeing etc. 13. Meals in hotels and on train are of pre-fixed menus and are generally decided keeping the palate of the overall tourists. Menus according to the specific preferences would not be possible. 14. As per the tour itinerary, hotel rooms at certain places are only provided for wash & change purpose. Passengers should not expect rooms to given to them for longer duration. Check-in at hotel rooms at certain places may be delayed to the due delay from hotel in providing the rooms. 15. AC First class - hass cabins with 4 berths (two lower & two upper). The cabins can be locked from inside as it has a sliding door. AC Two Tier - has open cabins with 6 seats (Four on one side of the pathway and two on other side). Four seats cabin has two lower & two upper berths. The cabin does not have door and instead has a curtain. Two Seats (one lower & one upper) are on the other side of the pathway. These two seats also have curtains. AC Two Tier (Inner Berth) - has open cabins with 4 seats on one side of the pathway. Four seats cabin has two lower & two upper berths. The cabin does not have door and instead has a curtain. AC Two Tier (Side berth) - 2 seats on other side of the pathway. Side berths have one lower and one upper berth. The cabin does not have door and instead has a curtain. AC Three Tier - has open cabins with 8 seats (Six on one side of the pathway and two on other side). Six seats cabin has two lower, two middle & two upper berths. This cabin neither has door nor a curtain. Two Seats (one lower & one upper) are on the side of the pathway. There is a limited storage place inside the train. The luggage can be placed under the seats / berths while on train. Hence, passengers are advised to travel with minimum luggage. 16. Passengers are required to take care of their luggage / belongings themselves. IRCTC will not be responsible for any loss or damage of any of the luggage / belongings at the Railway Stations / Train / Bus / Hotels etc. 17. It is the responsibility of the tourist to carefully read and fully understand all the terms and conditions / services to be offered / type of services to be offered etc. of this tour before making booking. In case of any doubts / clarifications, the same should be cleared with IRCTC before making the booking. (b) Cancelling or accepting the cancellation where you will receive a refund of payment without interest remitted to us. However, there will be no refund of any service such as pre /post tour accommodation, airline tickets, visa charges etc.